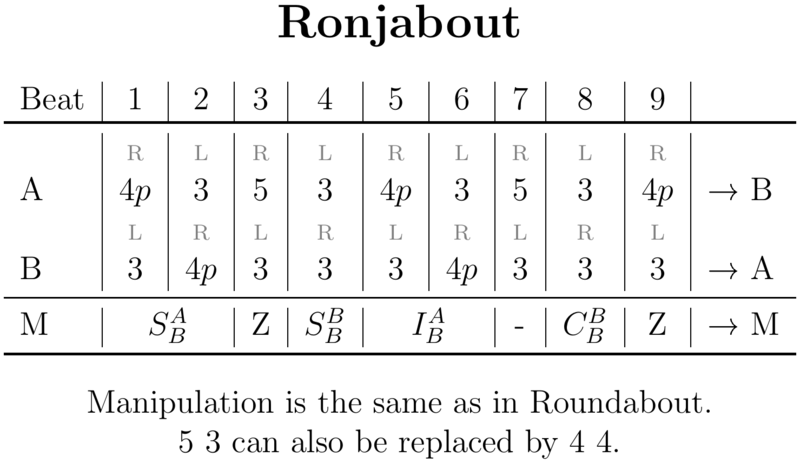 Ron­j­about is a 3-per­son pat­tern that uses the same manip­u­la­tion sequence as the well-known Round­about, but with an extra club in the base pat­tern. Start­ing from 7-club two-count, the manip­u­lat­or sub­sti­tutes a pass from A to B. A reacts by going into two rounds of 4-count pop­corn (either with a triple self or with two heffs), while B does the tra­di­tion­al round­about exchange with the manip­u­lat­or. In the end, A passes twice (on 2-count), at which point the new manip­u­lat­or will be stand­ing in front of them. The pat­tern was dis­covered by Ronja's jug­gling group, which gave it its name. Share with your friends and juggle together! Ivy on V – "Ice Cream Factory"